Chris was a great supporter of GMCDP and regular at GMCDP events - he also features in many of our archive photographs of demonstrations and protests. 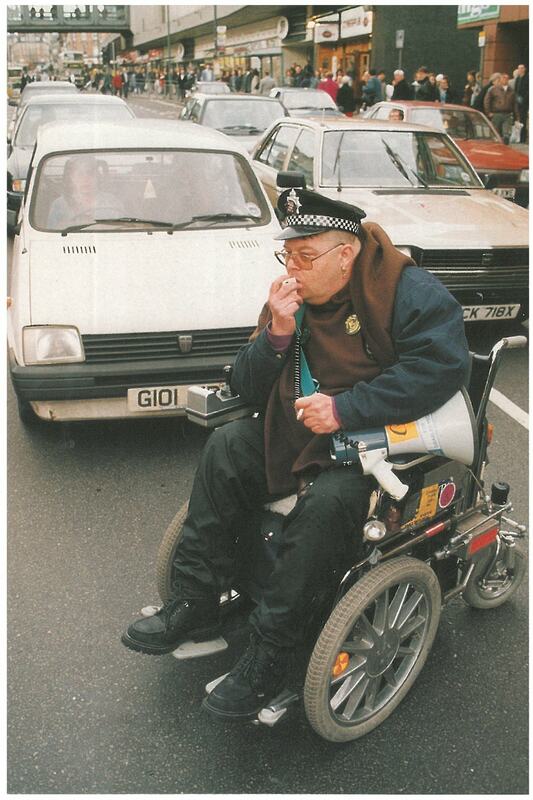 Chris was a stalwart activist, one of the founding members and ongoing organisers of the Disabled People’s Direct Action Network, and more recently involved in Disabled People Against Cuts and Not Dead Yet UK. Chris was also passionate about social justice and equality and was at the forefront of campaigns for lgbt rights. As well as his continuous campaigning for disabled people’s rights, through his work at Derbyshire Coalition for Inclusive Living, giving personal support to other disabled people and taking part in campaigns, Chris was also a strong-but-gentle, very big-hearted, warm, generous man. Chris was so much more than a campaigner and warrior. Chris loved life and was determined to live it to the full; devoted to family and friends he also found time for sport, music (especially ska) engines and adventure. Above all Chris was incredibly modest and always sought collective praise rather than individual acclaim. Chris was an absolute legend who will be desperately missed by many. As disabled people we owe an enormous debt of gratitude to Chris and those loved ones who shared him with us.